‘Das neue Deutschland’, the latest incarnation of the German national team routed Fabio Capello’s England 4-1 in Bloemfontein. Two early goals from Miroslav Klose and Lukas Podolski gave Jogi Löw’s young squad the advantage before Matthew Upson’s header brought England back into the game. Moments later Frank Lampard appeared to have scored a spectacular equaliser. In what will surely rank as one of the most controversial refereeing decisions in the history of the tournament, neither referee Jorge Larrionda nor his assistants noticed the ball cross the goalline. After the break Thomas Müller was the beneficiary of two superb counterattacks from Germany, notching a brace and ending all hopes of an English revival. Germany started the game at a frantic pace. Mesut Özil, the World Cup’s outstanding player to date, found himself through on David James’ goal after his supreme first touch took him past Ashley Cole. Özil was denied by the feet of James, the first of many impressive saves from the Portsmouth goalkeeper. James was powerless to prevent Germany’s opener in the twentieth minute, however. A long goalkick from Manuel Neuer reached Miroslav Klose following poor defending from John Terry and Matthew Upson, who allowed the ball to bounce for the Bayern München striker. Klose netted his fiftieth goal for Germany, holding off the challenge from Upson and stretching to prod the ball past David James. It was the archetypical ‘Route One’ goal, completely the opposite of Joachim Löw’s favoured method, but Miroslav Klose is peerless in such situations. The goal prompted a prolonged period of German pressure. Klose almost scored his second after remarkable build-up play from Mesut Özil and Thomas Müller. The Polish-born striker took the wrong approach, firing his low shot straight at the goalkeeper. Just minutes later, Lukas Podolski made no such mistake. Klose chipped through for Thomas Müller who, instead of taking the shot himself, clipped across the goalmouth for Podolski. The Köln striker threaded his shot from an acute angle through the legs of David James, giving Germany a deserved two goal advantage. England were shellshocked. The Three Lions had failed to impress in the Group Stage but were in the midst of their worst performance under the stewardship of Fabio Capello. Despite their failings, England found themselves back in the match just eight minutes before half-time. A quickly taken corner was played short to Steven Gerrard. The England captain crossed high into the penalty area where Matthew Upson rose to glance a header past the poorly positioned Manuel Neuer. The goal reenergised England, who for the first time seemed capable of finding a way past a previously unbothered German defence. They should have had an equaliser. Frank Lampard received the ball just outside the penalty area before turning and half-volleying over the outstretched Neuer. The ball ricocheted off the crossbar and bounced more than a foot behind the line before hitting the bar once more. Fabio Capello had already begun a passionate celebration. Jorge Larrionda and his assistants had failed to give the goal. A cacophony of boos reverberated around Bloemfontein with good reason. Forty-four years had passed since Geoff Hurst’s controversial effort was adjudged to have crossed the line at Wembley, but revenge was granted to Germany. It appeared as if this terrific encounter between two of the world’s most exalted national teams would be overshadowed by the controversy. The outrage persisted throughout halftime and on into the second half until the 64th minute. England committed players forward for an attacking free-kick, but Frank Lampard’s attempt was blocked by the wall allowing Thomas Müller and Bastian Schweinsteiger to break forward at breathtaking pace. Schweinsteiger, a mazy winger until two seasons ago, embarked on a staggeringly long run into the English half before laying the ball into the path of Müller. The Bayern München forward, who had only begun his professional career with the Munich club in 2009, was enjoying an astonishing performance and crashed the ball past David James to effectively end the game as a contest. It soon became a rout, Müller again capitalising on a breakaway. Mesut Özil had been having his quietest game of the tournament thusfar but was able to muster another dash forward. He squared the ball for his former Under-21 teammate Müller, who finished superbly. England failed to mount a sincere threat after the fourth goal. Wayne Rooney’s poor record in international tournaments continued. The Manchester United striker is one of the world’s most treasured footballers but his performances in this World Cup have been bereft of the energy, touch, movement or precision that characterise his displays for his club. The final whistle brought the curtain down on an abject failure for England. For Germany, however, what was considered a bright future has become an exciting present. The DFB’s (German Football Association) policy of developing youth coaches and involving players from a variety of different ethnic backgrounds has been inspired. Under the guidance of Jogi Löw, this German team is sure to succeed at international tournaments into the next decade. The young achievers’ reward for their dominant victory is a place in the Quarter Finals, where they will face the winners of Argentina versus Mexico. 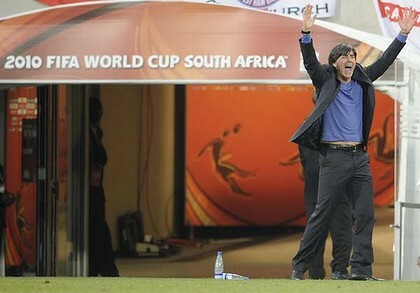 Löw himself has stated that he does not expect to win the 2010 World Cup but the possibility is there. With confidence surely rising this German team may not have completed their experimental venture yet. This entry was posted in Match Reports, Match Reports and tagged 2010, Özil, Bloemfontein, Boateng, FIFA, germany, Gerrard, Heskey, James, Khedira, Klose, Lahm, Lampard, Müller, Mertesacker, Mueller, Neuer, Oezil, Podolski, Rooney, Round of 16, Schweinsteiger, South Africa, Terry, Upson, World Cup. Bookmark the permalink.